Whether you’re holidaying at home or abroad this year, there is no better time than now to consider what will happen to your hair and skin as you prepare to bare. Thoughts here at The Liberty Shopping Centre in Romford have turned to summer skin care. 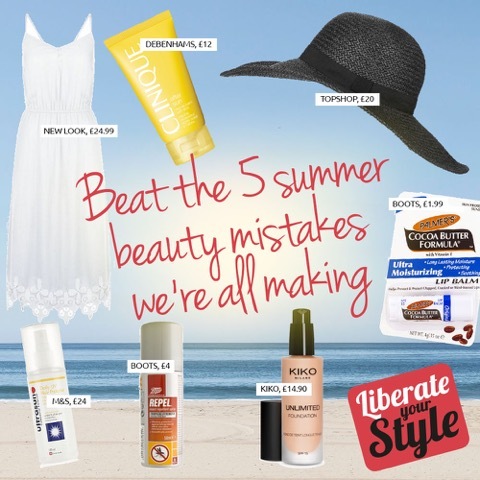 While we’re sure you’re fully stocked up on sun lotions to protect your skin, we’ve also identified the five big mistakes we’re all making – and come up with clever solutions from some of our many health and beauty stores. So your bag is bursting with sun cream for your skin, but did you know that UV rays and chlorine damage your hair too? Protecting your mane is a must with Ultrasun Daily UV Hair Protector from Marks & Spencer (£24). When confronted with salt, chlorine and hot weather, this protection spray will give your hair the TLC it needs and defend your locks against damage. It also wouldn’t go amiss to treat yourself to a new hat to protect your hair AND shade your face. This Topshop floppy straw hat (£20) would do just the trick and will bring effortless style to your holiday wardrobe. Not protecting your lips from the sun? Looking after your lips is an often-neglected part of your sun protection regime, and should be included alongside regularly applying a high factor SPF. To avoid burnt, chapped lips why not try the Palmer’s Cocoa Butter Formula Original Ultra Moisturising Lip Balm from Boots? (£1.99). Not only does it smell delicious, it contains SPF 15 and is a perfect fit for your beach bag too! As well as preventing skin damage, it is equally important to invest in sufficient aftercare products. Struggle with sunburn? Invest in an aloe vera based aftersun such as Clinique After Sun Rescue from Debenhams (£18). Aloe vera is a cooling and natural way to soothe the skin whilst preventing peeling. Wanting that little bit of poolside glamour? Don’t forget sun safety in pursuit of style. Invest in the Kiko Milano Unlimited Foundation (£14.90). This foundation comes in 14 shades and contains SPF 15 to ensure your face is protected against harmful rays – what’s more Kiko also offers a range of other products, including lip balm and glossy lipsticks containing SPF too. Insect bites at home and abroad can be unsightly and unpleasant, especially if they become itchy or infected, so plan ahead to avoid being feasted upon this year and invest in a good-quality insect repellant to fend off mosquitos and other bugs – we recommend Repel Insect Repellent from Boots (£4). You can also minimise the chance of being bitten by wearing light coloured clothing such as whites and pastel shades, as insects are more attracted to dark colours such as navy blue and black. Show off your tan with this white New Look Dress (£24.99). This dress is perfect for both day and night and incorporates a crochet trim, creating a dainty, graceful outfit.